Emma passed out after long walkie! 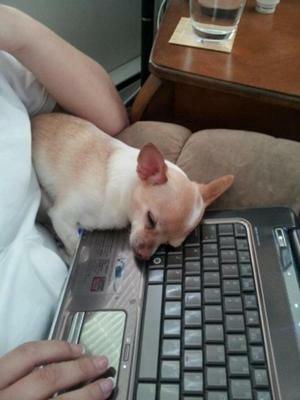 Our 9 yr old chihuahua went for a long walk and she was so tired afterwards she fell asleep on our laptop. Join in and write your own page! It's easy to do. How? 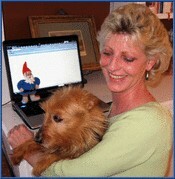 Simply click here to return to Dogs are Funny. 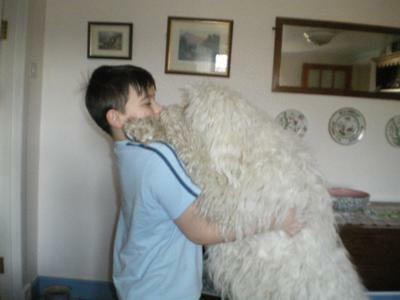 This is my Mum's Golden Doodle giving my son a great big smacker! 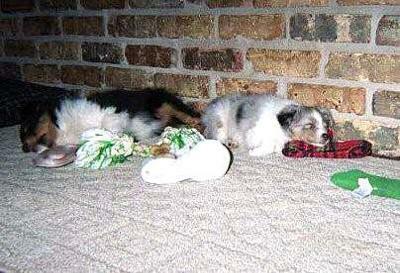 These are our two Shelties when they were about 9 weeks old. They had played so hard they just passed out. 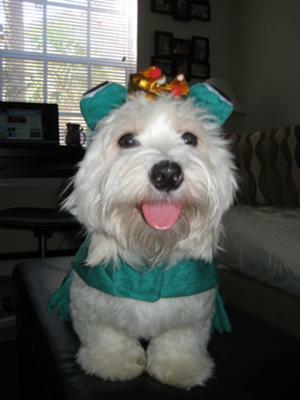 This is Roxie in her funny dog costume several Halloweens ago. 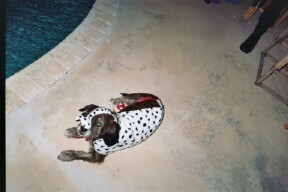 She was dressed as a Dalmation to go along with her Mom who was Cruella Deville. 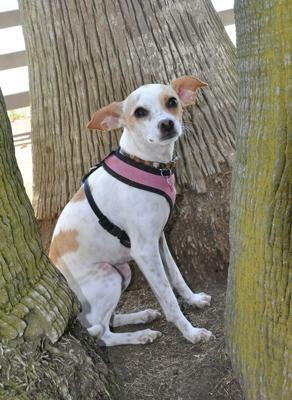 Roxie is a beautiful mixed breed (undetermined) who doesn't normally have spots. She didn't mind too much - she loved the attention. 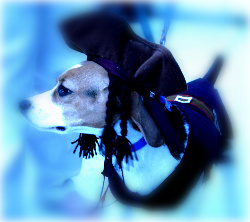 Bailey's funny dog costume last Halloween was dressing up as Jack Sparrow. Not too much of a stretch for a Beagle who is always stealing booty and burying treasure. 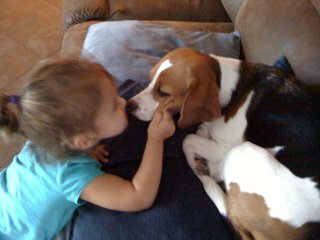 Hannah and Bailey sharing a moment of pure love. 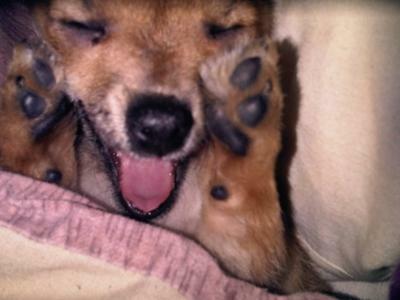 In this picture Deena is yawning, such cuteness. When I come home with bags, Cooper and Casey go crazy; they know I bring something for them. 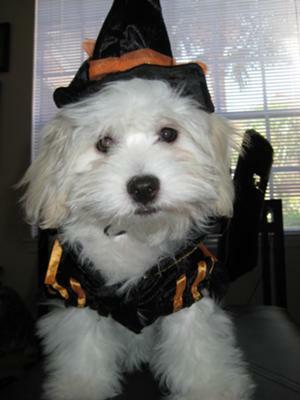 That time I brought costumes for Halloween and they loved it. This is Boomer a 10 lb Yorkie-Maltese mix who thinks he's a 75 lb. Doberman. He's small in stature but does have a BIG personality. 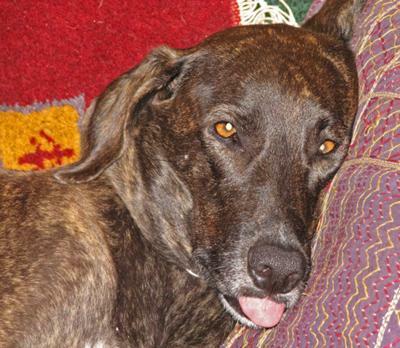 When I first got my dog Osa, she'd often sleep with her tongue sticking out. This time just as I was taking her picture, her eyes opened. Caught in the act! This isn't really a behavior problem. More like hilarious to my husband and quite annoying to me. 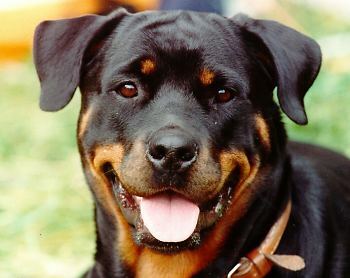 My husband has a rottweiler (came with the marriage). Although I call her a walking coffee table, she really is a sweet thing. Before we bought a house together (and lived separately) he would brag to me all the time about how that dog ONLY liked him. She was his baby, was loyal to him, blah, blah. Well, the dog follows me every where. Sleeps on the floor on my side of the bed. Goes in the house when I go in, EVEN when my hubby is still out there. She has acquired this extremely bad habit of, when I am at home working on my website for my home based business, talking to me in loud and long dog speak. Did I mention loud and long? And it doesn't stop. If I am really engrossed in my computer she will get extra loud to pull me out of my train of thought. She loves doing that. My husband just CRACKS UP! He says he's never seen her do it before with anyone and he just laughs and laughs. He follows that up with, 'Man, that dog loves you' as he slowly leads her out of the room. 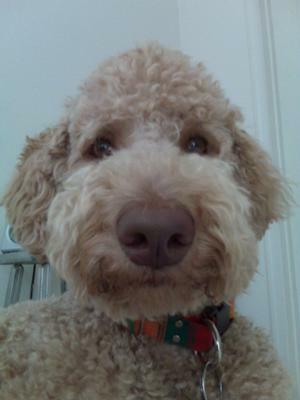 Dali is our french poodle. He is not only handsome, but he has such a great personality and is so giving. We truly love him and he loves us back. 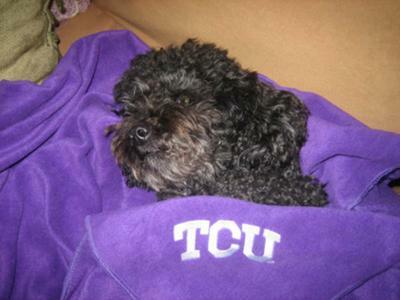 Enjoy him here wrapped in a TCU blanket! 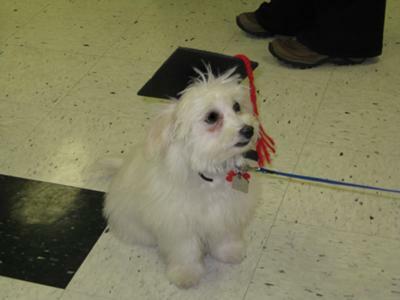 He was the star of his class graduating with honors. It was a proud moment for us all. 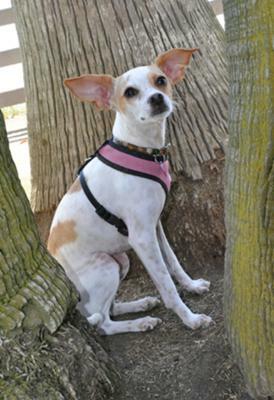 Have you ever tried to live with a very, very dumb dog? Now don't get me wrong, I love Jake dearly. He is a love and a snuggle bug but is not the smartest dog by a long shot. 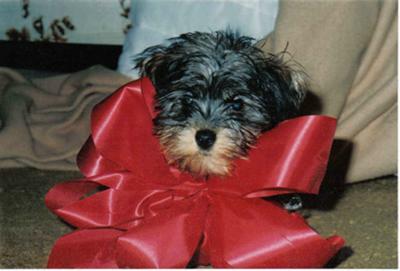 He is an Australian Terrier who jumps around like Tigger, Winnie the Pooh's friend, on mega caffeine. He doesn't remember who he is, where he lives, and any of the other essential knowledge a dog should know by about 9 months old. (Jake is now 13 years old). One day not too long ago when he broke through his electric fence, (one of those zapper deals), we searched high and low for him. Where did we find him hours later? He was in their garage helping himself to snacks. . . in the form of garbage. So she kindly brought him in the house where he promptly snatched her 4 year old daughter's cookie right out of her mouth! Needless to say, the very kind neighbor called me and asked me if I could come get Jake ASAP. My husband was a fan of leaving him at his nice new home but I ran over to collect the darling little beastie. Now Jake does have many, many excuses. He was a rescue dog. My Mom got him when he was about a year old and already full of very bad habits. (I personally think he was abused because he still flinches if someone moves too suddenly near him). I honestly believe that he must have been brain injured. . . poor thing. Anyways, Jake has been to so many obedience schools that he should have a PhD by now... but he doesn't. He just is a constant source of amusement as we shake our heads at how a cute little guy could be so dreadfully out-to-lunch. Butter is the cutest little dog I know. 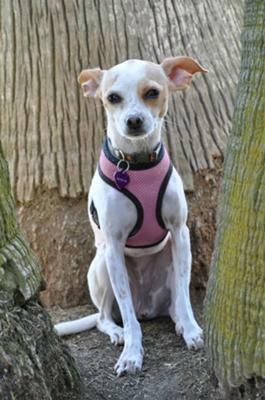 She's loving, playful, and happy. Once, when I was getting up in the morning, I got Butter out of the covers and she still wouldn't open her eyes. It was incredibly cute. Butter is the best dog I'll ever have! 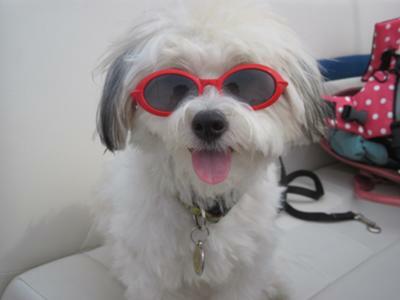 Jazzy loves summer, just like her mom and dad! She's a sweetie who loves to play with her kitty brothers. 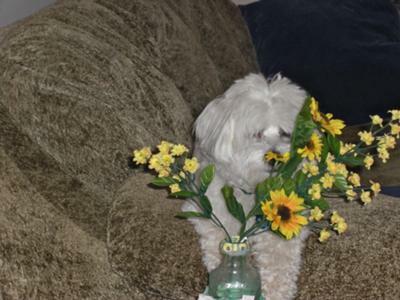 Tuffy loves flowers! He stops to smell the flowers, no matter that they are artificial! When we go for walks he does stop and smell the flowers. 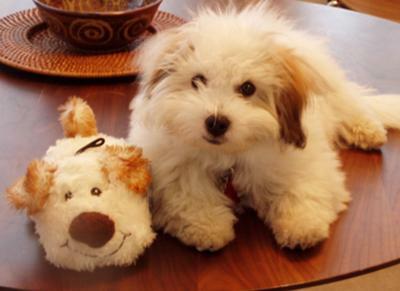 When our coton de tulear was a young puppy (2 months old) we found this toy that looked EXACTLY like him! In this picture we were able to get him to pose next to his toy - it's so cute! The trick to getting this picture was to take it early in the morning (while the pup was still groggy). Miko hates getting up early (he's always a zombie when you first wake him up). We were able to plop him on the table and he just sat there while we snapped the photo.